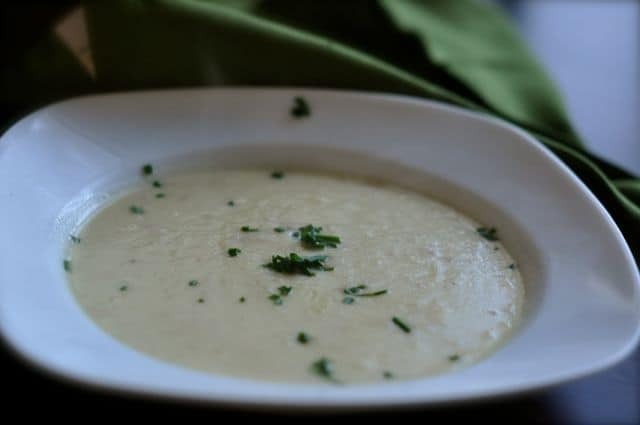 Cream of potato and leek soup is a great way to enjoy potato soup. Leeks lend a unique and different flavor than onions. I have also added a bit of bacon to this recipe. This potato soup is rich and creamy enough that you don’t need to add cheese, sour cream, and other toppings to make this soup tasty. My inspiration for this recipe came from two different places. One is The Seasoned Cook and a co-worker of mine. TheSeasonedCook gave me the idea to saute bacon with your onions/leeks to for soup making. My co-worker mentioned that she saw a cook make potato leek soup. So hence, came my inspiration. Finally I wanted a potato soup that you didn’t add extra toppings on. Sure, I love baked potato soup as much as the next person, but I also love cream soups for their simplicity. The process of this soup is to first cook the leeks and bacon together. Once these are nicely cooked, I add chicken stock, and potatoes, and cook until the potatoes are tender. I then remove some of the cooking liquid, and add heavy cream. This makes a very flavorful soup. Since the soup has heavy cream it will re-heat well. I topped my soup with some fresh chives but you could top your soup with croutons, bacon, cheese, and sour cream. Cream of potato and leek soup is smooth, creamy, and makes a great light dinner. Add potatoes to the pot, and then add chicken stock. If all of your chicken stock fully covers the potatoes, then you do not need to add additional water. Cook potatoes until tender, this will take about 15-20 minutes. When the potatoes are fully cooked remove a cup or two of the liquid and use an immersion blender to puree soup. If you do not have an immersion blender you can use a regular blender. Add heavy cream and stir. Taste and season with salt and pepper.